Jimmy Dean with his all-conquering Peterborough Sports team. Four local clubs will receive awards at the ChromaSport United Counties League annual meeting at Yaxley FC on June 21 (8pm). 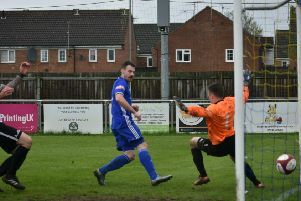 Runaway Premier Division champions Peterborough Sports, Deeping Rangers and Peterborough Northern Star will each pick up two awards with Yaxley FC receiving one. Sports manager Jimmy Dean will collect the Manager of the Year prize for the second year running and Sports will also receive the Highest Aggregate of Goals Trophy. Deeping Rangers have won the Adminsitrator of the Year and the Groundsman of the Year trophies thanks to the efforts of Austin Goldsmith and David Holmes respectively. Northern Star will get a Fair Play reward and the Programme of the Year prize with Yaxley taking the Respect Award.